These will be the poor, smallholder farmers (many of whom are women) and their families who grow staple, traditional and high value crops: an estimated 85 million farmers. Consumers and traders in Eastern Africa and the EU will also benefit from new varieties. Through training of trainers, 100 students in East African universities each year post-project will benefit from the training programmes of this project. Four post-graduate students will receive training in the UK during the project. 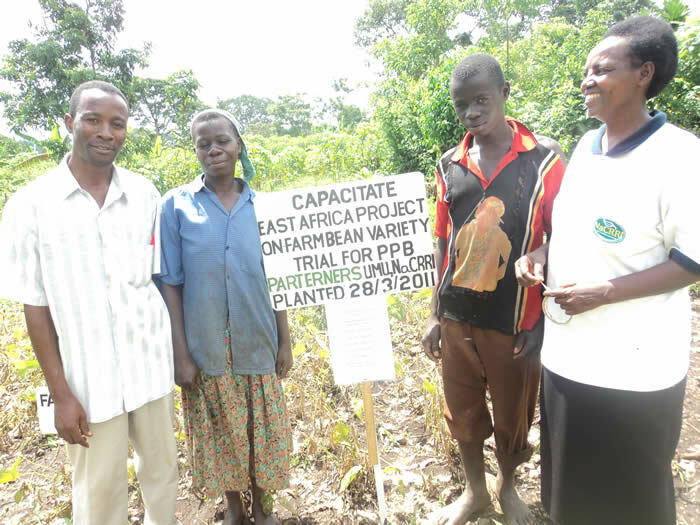 A scientist from Uganda Martyrs University (right) discusses a bean variety trial with farmers in their field.